We hope you plan to tuck this away on the ceiling, as it's not a good looker. A perfectly credible HD Ready DLP effort that only suffers in comparison with the Optoma HD72i. 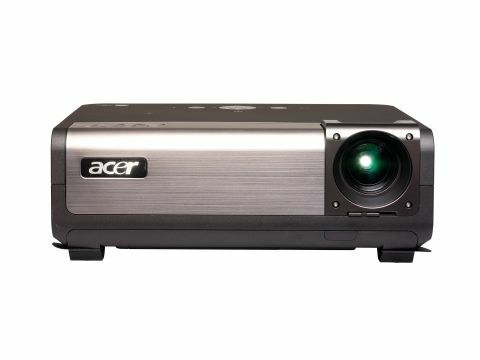 To date, affordable HD Ready DLP projectors have been few and far between. But now we're starting to see one or two models breaking the critical, LCD-rivalling £1,500 price barrier. One reason the PH730 is so affordable may be that Acer didn't bother running it by the design department. It really is a breeze block by home projector standards, combining bulk with a dull grey, plasticky finish. Reassuring, though, are the two digital video connection options: one HDMI and one DVI. There's also analogue PC support via a 15-pin D-Sub jack, phono-type component video inputs, the usual S-video and composite video fallbacks, plus a couple of unusual extras in the form of a VGA output and a USB port. Also unusual is the PH730's 1,280 x 768 native pixel count, giving a 16:10 aspect ratio where most HD Ready DLP projectors use 1,280 x 720 chipsets to give a movie-friendly, 16:9 widescreen aspect ratio. This sounds daft for a projector designed for the home theatre market, but many PC formats prefer the 16:10 ratio, making the PH730 potentially more of a multimedia all-rounder. There's a decent, though uninspiring, claimed contrast ratio of 2,500:1, high brightness of 1,200 ANSI Lumens and, unexpectedly, the facility to play 1080p HD pictures as well as the more regular 720p and 1080i types. Attractive onscreen menus, meanwhile, include one or two interesting features, such as white level adjustment, degamma tweaking, a 'Theatre' preset and individual adjustments for the red, green and blue image components. Our only niggles are that the PH730 doesn't always detect HDMI/ DVI sources without first switching them off and back on, and only supports RGB colour space through the DVI, leaving you with only the HDMI for attaching a (YUV colour space) Sky HD receiver. In action, the PH730 is really pretty good. It's particularly comfortable with high-definition sources, which help it demonstrate an unexpected crispness and eye for fine detail. Fast moving HD fodder, meanwhile, like a Premiership footie match, suffers less than many rivals with DLP's common fizzing noise over horizontal motion. Colours are also likeable, combining plenty of brightness and vibrancy with a pleasingly natural tone that holds good across a wide spectrum. And the projector does a really very decent job of upscaling standard definition sources to its 1,280 x 768 resolution, provided those sources are of a decent quality to start with.